With everything happening here in the community, following Bryan Sax’s tragic death, I can’t help but remember my friend and fraternity brother Chuck “Montana” Carlson as well… Chuck also died tragically young, from cancer at 36, almost the same age as Bryan. Chuck was a long-time Aspen resident, ski instructor, and hockey coach. He also left hundreds of friends here wondering how something like this could happen to such a great guy. As I was admiring the park and water feature there, I saw this bench! 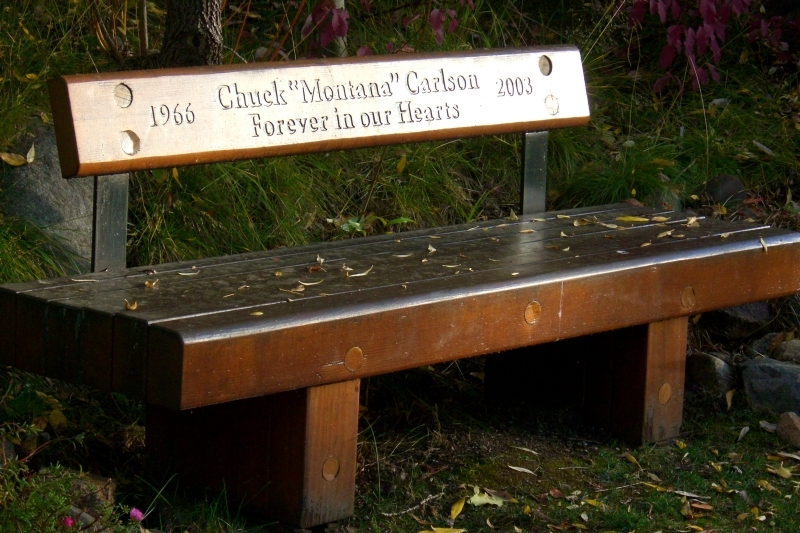 I didn’t even know there was a memorial bench for Chuck, and here, at the end of a perfect fall day, the setting sun shone right on it. It brought me a sense of peace, and really just made me feel so at home here, like I really do belong in Aspen. This entry was posted on Monday, December 8th, 2008 at 11:55 pm	and is filed under friends and tagged with fall, friends, parks. You can follow any responses to this entry through the RSS 2.0 feed. You can leave a response, or trackback from your own site.